Supported rides means no carrying stuff! If you’re thinking of pushing yourself to try a longer ride, this might be the time. You’ll be with a group of riders, and there will be support from race organizers in rest and food stops along the way. 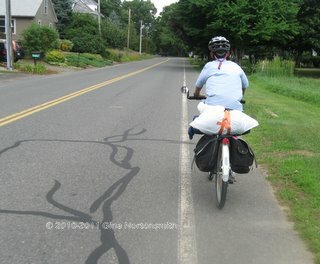 Several years ago, this was my first century, 100 mile ride. It was definitely a stretch for me and my riding partner. The first 50 miles up to Brattleboro were fine. By the time we reached the rest stop at 75 miles I was really dragging. The folks at the rest stop helped me eat and drink the proper things which helped me recover and complete the ride. 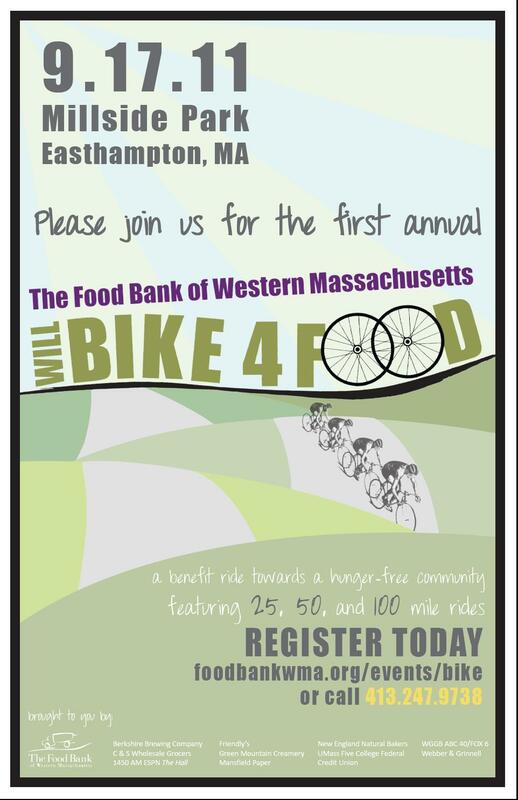 The next day weekend, Sunday Saturday, September 11 17 is the newcomer, Will Bike 4 Food, sponsored by the Food Bank of Western Massachusetts. This ride starts from Millside Park on Ferry Street along the Manhan Rail Trail in Easthampton. This is the same place the Manhan Rail Trail bridge Grand Opening took place. They offer rides of 25, 50 and 100 miles with rest stops and refreshments. You can bike as an individual, or as a team. There is a small entry fee, and a $250 fundraising minimum per cyclist. The after party includes music, food and drink. I’ve written about this event ride previously. The third ride is a celebration of cycling in the Pioneer Valley. 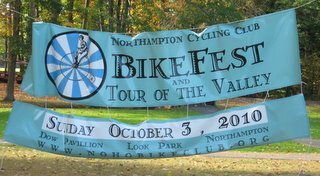 Sponsored by the Northampton Cycling Club, Bike Fest on Saturday, September 24. Five different rides are scheduled, 8, 25, 40, 65, and 104 miles. Rest stops and S.A.G. support offered. These rides begin and end at Look Parkin Northampton which has lots of activities to entertain non-riding members of the family, or those who finish rides at different times. Best Fest will feature food, craft beer, and music by local musician Roger Salloom. More than just the rides, it is a chance to hang out and visit with other cyclists, perhaps find a new buddy to ride with. I was able to catch the tail end of last year’s Bike Fest – the Fest, not the Bike part – and it was fun! There were bikes and riders everywhere! The food looked great and there were lots of happy riders. Check out my write-up and pictures of last year’s Bike Fest. Event organizers have made some improvements to last year’s routes and support and list those on the registration website. With these three rides you could put together a program to get yourself ready for a longer distance ride at Bike Fest. What a great way to cap off the traditional riding season! I encourage you to check out these rides, but if you can’t ride in them, watch out for the riders on the road and help them have a safe, enjoyable time here. Cyclist, Mom, Travel Nut, Bike Riding Empower-er! This entry was posted in Destinations, Events, Joy, Touring, Tourism and tagged Bike Path, Biking, Cycling, Easthampton, Events, Hatfield, Look Park, Northampton, Recreation, Scenic, Touring. Bookmark the permalink. I had not heard of that one. Thanks for adding it to the list! Thanks for this post! It was helpful; since you don’t seem to have updated the blog since May, I just added a post to my site with late summer/fall 2013 events, in case anyone stumbles across this and is looking for what’s going on this year. Thanks, Brian. No, I have not updated this year’s local rides. There are quite a few, too many for me to keep up with. Ride safe.